A great investment opportunity, this farm has many flat building areas spread through out it`s rolling hills, all with sweeping mountain and river views. The property has just over 1 km off river frontage with numerous large flat areas along the river as well. The property already has a cute house with power and water. It is in the very small community of Tres Piedras, aprox 8 km off of the paved road in Platanillo, and about 30 min from the beach. 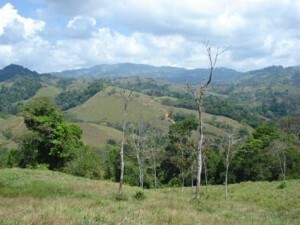 Most of the property is pasture with small clumps of jungle throughout making it easy to develop. It would also make a great farm if you wanted to raise animals. The neighbouring farms are also for sale and could be joined together to make a very large develpment or anything else you can think of! !